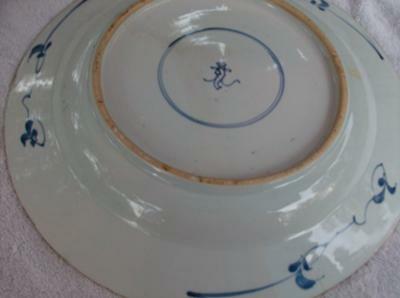 I have had these Chinese blue & white porcelain chargers for many years. 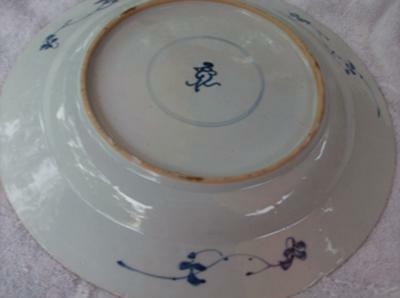 I recently started to really take a closer look at these blue & white porcelain chargers. They were a gift from friends and are very beautiful. I would like to know more about the history behind these pieces, especially the marking on the back. ? I think they are Chinese Export from somewhere around the early decades of the 17th Century but would love comments from other people. Are they Kangxi or Imari maybe? They are Blue & White with copper coloring inside the rim near the center and most of the floral areas have gold highlights. Anyone having knowledge of these, please respond and also I would love to know what they might be worth. If anyone has a pair of blue and white chargers in good condition please email leiticia AT aol.com. 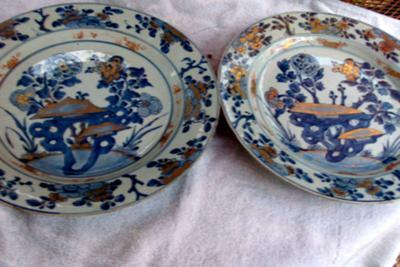 These plates are early 18th Century Chinese Kangxi. 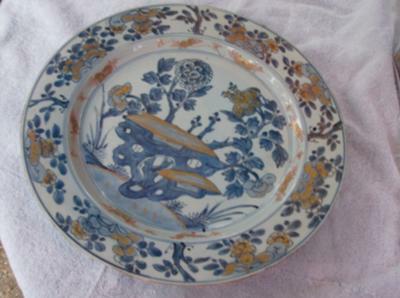 They were made during the reign of the Emperor Kangxi and subsequently over-decorated probably in Holland some time later. The mark on the back is a ‘Shell’ and represents ‘A prosperous journey’ it is a well known Buddhist symbol.